Reason for reading: JR, I can't quit you. I think you have to be a pretty hard-core fan of the series to enjoy this particular book. Which I am, and I did, but there were also a lot of things that were kind of... terrible. Someone should really put a shock collar on JRW and set it to taser her every time she writes something involving the words "partake" or "unto." Scenes written in this psuedo-historical narration have been cringe-worthy since the first book and I honestly think they're getting worse. Interestingly, The King starts with a flashback scene featuring our Wrath's father, Wrath. You had to read a few pages into it before you were sure that it was the previous King Wrath, and I think the Olde-Timeyness of the language was deliberately toned down... and it was so much better than other scenes where it was not. I refuse to believe that Miley Cyrus plays any part in the world of the Black Dagger Brotherhood. Period. I am excising the three (THREE!!) references from my brain. It never happened. We won't speak of it again. This book was aptly titled, because Wrath really was the centerpiece, and he has a lot of work to do. If Dark Lover was something of a coming of age story for Beth, this is one for Wrath. He comes to terms with the value of his kingship, his blindness, and his future in general. He does some things in this book that I think are long overdue in the world-building, and it is a good thing indeed. However, I would've liked to have seen more of the reactions from his populace -- both the commoners and the glymera. There were scenes that seem conspicuously absent in retrospect. I also really liked the background on Wrath's father. I think this is the first "history" we get of the race that isn't from a current character's point of view -- we just get to see some stuff that happened, that (our current) Wrath was not actually part of. Like all of the books in the BDB, there is a lot going on here. Besides the arcs with Wrath and Beth and the kingship, there is a Trez arc, an Xcor/Layla arc, and the Assail/Sola arc. If this annoys you in general about the BDB books, it's probably going to be a bigger problem than usual for you. Of the secondary arcs, I really like how the Sola/Assail one is going, although the folks who say it seems unconnected and distracting have a point. I don't know, there's something about those two that has hooked me in a way that Xcor/Layla did not. Trez has some interesting problems to get handled too; I'm looking forward to that story (which is apparently going to be in the next book, according to announcements made at Saturday's Cincinnati signing for The King (you can find the transcript at JR Ward's Facebook page). Unfortunately, I found the Xcor/Layla pairing to be pretty much just terrible all around. Xcor does a wholly unbelievable 180 degree character turn, and not much else other than pining and thinking. Although one of the best moments was when he was buying a new wardrobe and the clerk at Macy's looks him up and down and says, "You're not from around here, are you?" I cracked up. Are people still arguing about whether the BDB books are romances? This one is probably less in that mold than any so far. I have always staunchly said: "YES, they definitely are!" but the romance is less central to this book than any so far. I think this book could have done with fewer side-arcs and deeper treatment of the kingship arc -- it felt like a lot of things were glossed over. 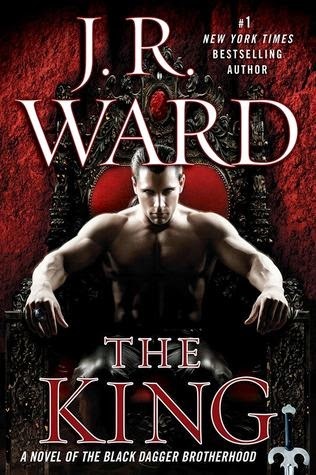 The things that I don't like about JR Ward are present and accounted for and just as unlikeable in this book -- the annoying Olde Timey-speak and the fact that everyone has essentially the same voice, primarily. But it is still somehow a can't-put-it-down story that kinda makes me want an oversized, over-testosteroned-up vampire of my own. As always, if you have reviewed this book feel free to leave a link in comments! Great review! There is so much in the books that feels wrong, yet somehow reading them is a pleasure. Isn't that the truth? It's like a big nasty plate of piled-high nachos or something - so many bad things on the plate but you don't stop until it's all gone. Then you think, "but why? WHY?? why was that so good??"